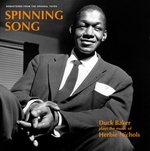 To commemorate Herbie Nichols' 2019 centennial, Triple Point Records is proud to announce the first-ever vinyl issue of Spinning Song, Duck Baker's '90s classic. Spinning Song contains solo acoustic guitar renditions of nine Nichols compositions, meticulously remastered from the original tapes. The set includes all of the original liner notes along with a new Duck Baker essay and two previously unseen photos. One of several records devoted to the music of Nichols that appeared independently in the mid-1990s, Spinning Song has been regarded as a milestone by guitarists ever since. Baker had made his reputation over the previous two decades as a master fingerstyle guitarist working mostly in folk, ragtime, and swing, but this was his first real entry into the world of jazz guitar, and his background gave him a unique approach to Herbie Nichols. The enigmatic pianist and composer Nichols (1919-63) has forever been one of jazz's insider figures. Though he was the composer of "Lady Sings the Blues" for Billie Holiday, Nichols' compositions were little known, circulated, or performed in his lifetime. Two records for Blue Note made from several 1955-56 trio sessions are the central repository for Nichols' very personal original music. He died in obscurity, but in the 21st century, Nichols is rightly hailed for a profound and offbeat writing style comparable to that of his contemporary, Thelonious Monk. Upon its original release, the jazz press gave Spinning Song a warm reception, and Acoustic Guitar magazine proclaimed it "one of the best guitar records ever recorded - by anybody." High-quality, translucent red vinyl, limited pressing. On this LP, recorded at studio sessions in 2010 and 2015, Duck Baker delves deeply into the thinking of one of the most challenging composers, and renders guitar interpretations that are true to the original intent. That Baker's experience playing blues, gospel, ragtime, and swing serve him well on this project goes without saying. 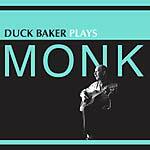 Duck Baker Plays Monk contains solo acoustic guitar renditions of nine Thelonious Monk compositions. Baker will remind you through his playing that the idiosyncrasies of Monk's composing are further dimensions of the Americana continuum (and source musics) that has been his turf for years. Especially in Monk's centennial year, many will address Monk's oeuvre: Hundreds will in fact interpret the texts, but very few can inhabit this music in the way that the mature Duck Baker can. Includes new essays by Duck and the late Roswell Rudd. Available exclusively on high-quality vinyl; limited one-time pressing.